BALTIMORE — Weekly services, Torah studies, aliyot to the Torah, sitting shiva and even trips to Israel  these are experiences shared by many Jewish Americans affiliated with synagogues and Jewish communal organizations. But for Liz Weintraub and her husband, Philip, full inclusion in life events such as these wasn’t always a foregone conclusion. That is, until they became members of B’nai Israel Congregation in Rockville, Md. Although Liz Weintraub, 47, grew up in a family that was engaged in Judaism in Virginia before she joined B’nai Israel, her involvement in synagogue life was merely peripheral. Due to her intellectual disability, Weintraub usually found herself on the sidelines  not truly part of the Jewish community. But when a group from B’nai Israel traveled to Israel last year, the Weintraubs were part of it. ”We were fully included  just part of the trip,” said Weintraub. Steven M. Eidelman, a professor of human services policy and the leadership and faculty director of the National Leadership Consortium on Developmental Disabilities at the University of Delaware, looks forward to a time when the Weintraubs’ experience is not unique. As the former CEO of The ARC and a past president of the American Assn. on Intellectual and Developmental Disabilities, Eidelman said he has seen a big gap, both in the Jewish communities willingness to change their attitudes toward Jews with disabilities and in the scarcity of leaders in Jewish organizations with the skills to implement such change. Eidelman directed the first Jewish Leadership Institute on Disabilities and Inclusion this month at the Pearlstone Center in Reisterstown, Md. While Eidelman, who grew up in Baltimore, acknowledged that gains are being made, he and others at the institute stressed that Jewish communities could be doing much more to make their institutions inclusive to those with disabilities. If we can do this [institute] a couple of times a year, maybe well get a cadre of 500 people involved. That might be enough to start a movement, he said. Weintraub believes the bonds forged with the Bnai Israel group on the trip set the stage for their deepening involvement with the congregation. In January, 2013, when her mother passed away, many friends from the Israel trip, as well as the congregations Rabbis Jonathan Schnitzer and Michael J. Safra, were there sitting shiva with her. Just a few weeks ago her husband had an aliyah to the Torah to celebrate the 28th anniversary of his Bar Mitzvah. SHELLY Christensen, author of Jewish Community Guide to Inclusion of People with Disabilities and one of the institutes faculty members, said at the inclusion conference that when talking about inclusion, both professionals and lay people need to learn to distinguish between meaningful inclusion and including a person with a disability as an act of kindness. ”Look at a person and see the divine in them, see their humanity. Treat them like everybody else,” she said. ”A Jew with a disability should be accepted as a full congregant just because he or she is another Jew, not as a mitzvah project,” Eidelman said. Although not all disabilities advocates agree, Eidelman and Christensen don’t favor separate or special programs, classrooms, or housing. ”It’s not them versus us, it’s us,” said Christensen. Paul is head of Sulam, a Rockville program for Jewish students with special needs that enables them to thrive in day school environments. ”If I had a dollar for every family who told me they disengaged from the Jewish community because their kid was not welcomed in a Jewish school, I’d be a rich man,” said Paul. Another institute faculty member, Rabbi Lynne Landsberg, senior adviser on disability issues for the Religious Action Center of Reform Judaism, was an advocate for passage of the 1990 Americans with Disabilities Act long before she became disabled herself. Until a near-fatal car accident that resulted in a traumatic brain injury in 1999, Landsberg never dreamed that her advocacy work would impact her own life so directly. After her accident, the rabbi spent six weeks in a coma followed by a four-month hospital stay. She required years of rehabilitative therapy in order to regain the ability to talk, walk and read. Once she was well enough to leave her home, the rabbi was confronted by a devastating reality. Despite the ADA, discrimination against the disabled was alive and well in both the Jewish and greater communities. About a year after the accident, the rabbis former employer, Rabbi David Saperstein, director and counsel at RAC, asked her to return to work there. The invitation changed everything for the rabbi, both professionally and personally. ”I couldn’t do anything without a script, and I could only work a couple of hours a day. But my social action neshamah (soul) was still intact,” said Landsberg. “I told him I wanted to work solely on disability issues. LANDSBERG is hopeful that disabilities advocacy will eventually make it possible for other Americans with disabilities to enjoy the professional productivity that has been so meaningful for her. Synagogues worry — and rightfully so — about access to the bimah. “What about access to jobs?” asked Landsberg, who pointed to statistics on unemployment in the disabilities community; for instance, 60% of Americans with disabilities are unemployed or underemployed. Yet progress is being made, according to Landsberg and many others at the institute. She is especially proud of Hinenu (We Are Here), an initiative that came about from the alliance between the rabbi and an Orthodox disabilities advocate from Yachad, the Orthodox Unions National Jewish Council for Disabilities. Hinenu has grown to include human rights and disability professionals from four Jewish denominations working together to promote inclusion in synagogues for people of all abilities. Weintraub urged Jews to consider discrimination against those with disabilities in the context of Jewish history. 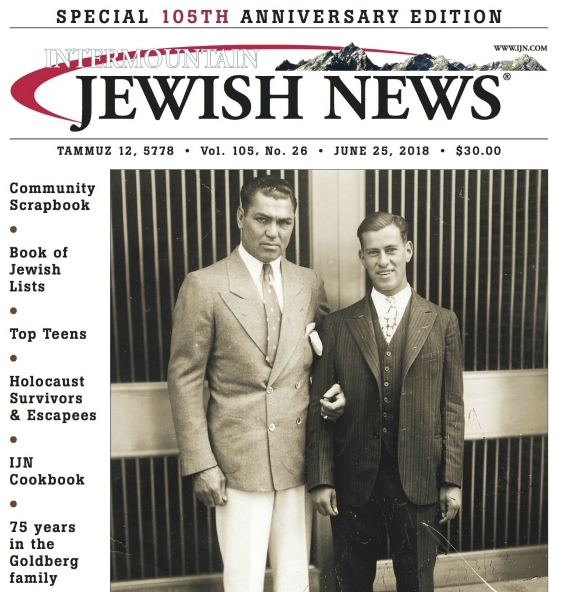 This story was first published by the Baltimore Jewish Times and has been edited by the IJN.